Welcome to Mountain Bike the Bruce! The freedom felt when it all comes together, when the wind rushes by you as you totally pin the trail in a perfect line, your passion for the sport ignites even more. It’s why you ride. The sport of “mountain biking” means so much: it’s the freeriders and the backcountry explorers. It’s dirt jumpers in skinny jeans. It’s fat bikers pedaling on snow in winter. It includes the family of four going for a leisurely pedal on beginner-rated singletrack trail. 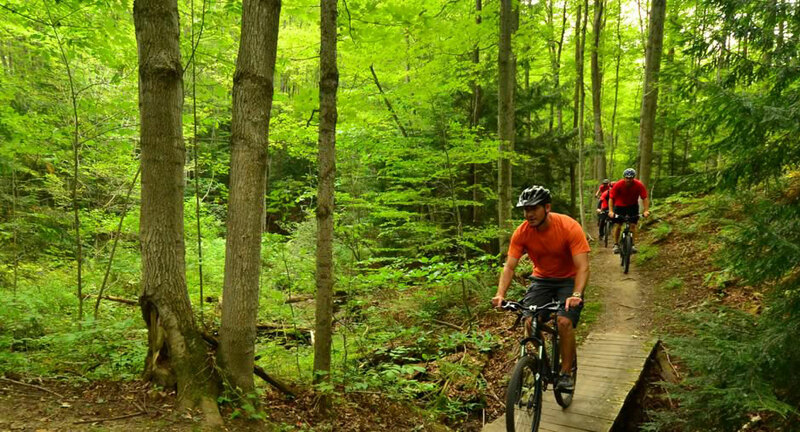 Bruce County is well-known for its ecological diversity and our mountain biking trails are no different. We have five trail propertoes with a combined 80 kilometres of trail to choose from and each property is distinctively unique; from the rocky Bruce Peninsula to the deciduous valleys of southern Bruce County. You can find an array of open and flowing to tight and technical trail concepts that include alternate lines for the more skilled riders. We even have chariot trails! Better yet, our trails are free to use. Locally know as the Albermarle Tract, this property is well known for its abundance of rock and technical riding. With approximately 20km of trail, we have something suitable for everyone. Come try out our pump track! This track is a continuous loop of packed dirt that can be ridden on a bike without pedaling. The track contains a series of rollers and berms that allow the rider to gain momentum and reach some serious speed. Established in 2001-2003, this property contains some spectacular single track trail. What makes these trails so unique is that they were build using hand tools. That’s right no machines were used. You can find single track trail ranging from easy to difficult and all trail intersections are marked so you can’t get lost. The network contains approximately 20km of trail. The trails at the Carrick are constructed on an aggregate base which means you can ride until the snow comes and after it leaves. The trails are virtually dry all year round making it a great destination after a few days of rain. Established in 2005, the property has roughly 8km of trail consisting mostly of single track. The rolling terrain offers some great climbs and spectacular views. This property has some of the sweetest single track available in Southern Ontario with more to come. Construction began in 2008 and to date we have roughly 10km of new single track and we expect another 10km completed by 2012. The Trail Crew has been working hard to create new experiences so come out and try out the trails! With 8000 acres of land at our disposal who knows where we will end up. If you enjoy riding the Carrick Tract come out and hit the Kinloss Tract for a quick ride. The property has some awesome elevation giving the trails some great flow. To extend your biking experience, leave from downtown Lucknow, just a couple of kilometres from the tract. Keep up to date on trail conditions, closures and new initiatives throughout the year on Twitter and facebook. The county is seeking volunteers to assist with a variety of trail maintenance functions on our trail properties. If you are interested, please review the following documents and fill out an application form.